To enable communication between MQTT devices, it’s necessary to use a MQTT broker as the central server for your M2M communication. Although there are some public brokers available like mqtt-dashboard.com, it’s a good idea to set up an own server for playing around. This post shows how to set up a HiveMQ MQTT server instance on Amazon Web Services Elastic Compute Cloud (EC2). As an additional goodie, we want to enable MQTT over websockets, so every browser can be a full-featured MQTT client! The first step is to launch a new EC2 instance. In general it does not matter which OS you choose for HiveMQ as it runs perfectly on every major OS. Any Linux distribution should be fine, I will use a Ubuntu 12.04 LTS. To get started, a Micro Instance will be sufficient, if you need real power and throughput, you should start with more RAM and more vCPUs. Security Groups are very important to configure correctly, otherwise we won’t be able to connect to our server correctly. 22: Needed for SSH. You probably lock yourself out if your don’t have this port open. Consider restricting this port to your IP adress(es) only. 8883: The MQTT standard port for MQTT over TLS. After launching EC2 instance, we should SSH into it to install Java and HiveMQ. Depending on your OS, these commands might be a bit different. 2013-11-30 23:04:50,225 WARN  - No license file found. Using free personal licensing with restrictions to 25 connections. That was all. Now you have a high performance MQTT server up and running in the cloud and you can start writing your MQTT applications on devices AND in the browser. Dieser Eintrag wurde veröffentlicht in Linux, MQTT und verschlagwortet mit HiveMQ, iot, m2m, mqtt von Dominik. Permanenter Link zum Eintrag. The HiveMQ installation was quite easy but I´m not able to connect the HiveMQ server. I got a connect time out exception over 8000 and also over 1883. Do you have any hints for solve the problem? did you set the security groups properly? Make sure your security group settings look like the ones in the screenshot. Does this help you further? Thank you for the post, it’s great. I’ve installed it on Amazon EC2 Ubuntu 14.04 Server. I can access and post messages through HiveMQ Websocket Browser Client, however when I try it from my phone, with the application called MyMQTT server refuses connection. Do you any ideas why it can be? Does any of these tips help? Let me know if that works for you! Could you please provide us a solution to run HiveMQ broker in background and store data from subscription topics to MySQL database using PHP. 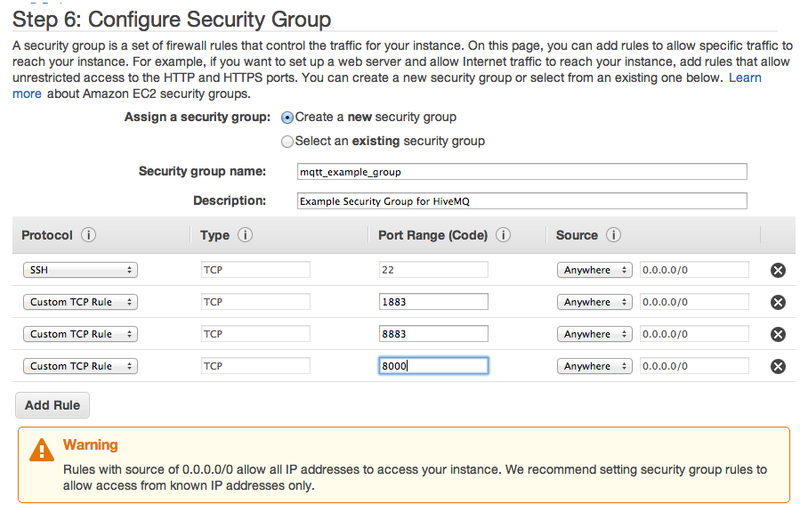 We’re running HivqMQ in AWS EC2 Linux instance as Apache, PHP.